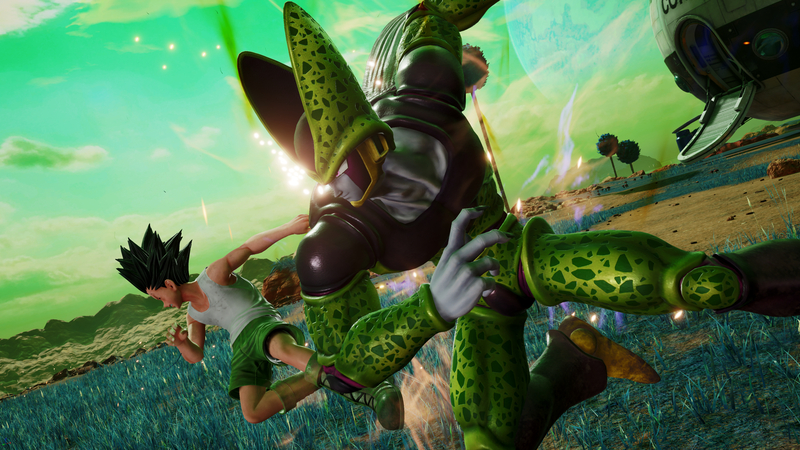 We had already heard that Dragon Ball’s Cell and Piccolo would be the latest characters to join Jump Force, but now Bandai Namco has officially confirmed their addition to its always-growing roster. In addition, new screenshots were released, showing them in action. Take a look at these two competitors. If you’re keeping track, Cell and Piccolo are the fourth and fifth Dragon Ball characters confirmed for Jump Force. They join the previously-confirmed Goku, Vegeta, and Frieza. Ironically, all five are also playable in Dragon Ball FighterZ, also from Bandai Namco. However, just looking at the two games show how different they really are, so you shouldn’t have to worry about any sort of Dragon Ball fatigue. The expansive Jump Force roster features more than Dragon Ball, of course. Some of the biggest names in manga are featured here, from Naruto to City Hunter, and even Rurouni Kenshin. Its story mode also features characters from Death Note, though none will be playable. And don’t forget the custom fighters you can make, as well. If you absolutely cannot wait to play Jump Force, you may want to check out its Ultimate Edition. Preordering it lets you play the game before it officially releases, in addition to other bonuses. Do you think you’ll be playing as either of these two when Jump Force releases on February 15, 2019? Do you think this is Dragon Ball overload? Let us know!